If you are looking to diversify your menu, you could start with learning more about grains. Changing one type of cereal for another can spruce up and refresh your meal plan and would be a nice change. So, how much of your current daily cereal intake is wheat and what other grains are you eating or should you be eating? Barley keeps coming up in food articles all over the Internet. Let’s see what the differences between the two are. Barley is a major cereal grain. Hordeum vulgare, by its Latin name, is a member of the grass family and one of the first grains cultivated by man. It now ranks fourth in quantity and area of cultivation. There are three categories of barley: two-row, six-row and hull-less barley. As far as appearance goes, the harvested grains are pale brown in color. Each grain has a bran husk that covers the germ inside. According to a 2013 ranking, Russia, Germany and France were the world’s top barley producers. Barley is an important grain in the food industry, especially in the production of alcoholic and nonalcoholic beverages. It is also used as animal feed. Half the barley production in the US becomes animal feed, while a quarter goes into alcoholic beverage production. Barley is the best suited grain for malting. Therefore, it is a key ingredient in beer and whiskey. As far as nonalcoholic beverages go, barley makes a great coffee substitute. Hulled barley has a rich, nutty flavor. Barley comes in the form of flour, flakes, grits, or as a whole grain. 100 grams of barley has 352 calories and is a rich source of nutrients such as manganese, magnesium, calcium and phosphorus. It is also rich in proteins, fiber and vitamins. Including barley in the diet can help prevent heart conditions, cancer, inflammation and indigestion. Regular consumption of barley can also lower cholesterol levels and is recommended for people suffering from type 2 diabetes. People suffering from celiac disease or from gluten allergies or intolerance should stay away from barley, however, as it contains gluten. 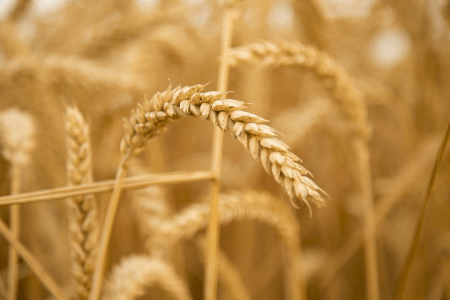 Wheat is a cereal grain. Triticum, by its Latin name, is the most cultivated cereal worldwide. The plant has a long stalk with clusters of kernels enclosed by spikes. The germ, the endosperm and the bran make up the grain. The harvested grains are golden in color. There are six types of wheat: hard red winter, hard red spring, soft red winter, hard white, soft white wheat and durum wheat. According to a 2013 ranking, the world’s top wheat producers were China, India and the United States. Wheat fuels the pastry industry and has a lot of other great uses. Wheat stalks have a variety of uses such as animal bedding and construction material. There would be no puff pastries without white wheat. It is great for cakes, cookies, muffins and pancakes and many other delicate treats. Otherwise, ground into semolina, cracked or germinated and dried to create malt, wheat finds it way in other delicious recipes. 100 grams of wheat holds 327 calories and is a great source of calcium, iron, magnesium, phosphorus, potassium, and zinc. People suffering from celiac disease, gluten allergies or intolerance should stay away from barley as it contains gluten. 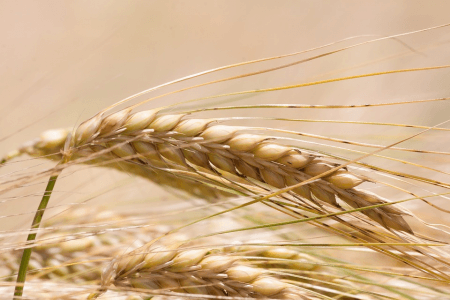 So what is the difference between barley and wheat? As far as appearance goes, barley has a long beard (the bristly material protecting the kernels) while wheat has a shorter one. When it is ready for harvesting, wheat is golden brown in hue, whereas barley is yellow-white. Although used in more foods, wheat must be milled and turned into flour, ground into semolina, or broken or pre-boiled to turn it into bulgur. By comparison, barley can be more easily cooked and served. Its preparation is as simple as that of rice. Even so, taste is on the side of barley, making it the preferred ingredient for malting. Weaker in taste, wheat does not make for a great brew. Wheat crops cover more land area than barley, which is merely the fourth grain in this respect. Wheat has a higher commercial value and we use it in a wider array of foods. On the other hand, the brewing industry prefers barley as an ingredient and so do animal breeders for animal feed.